Wells Lamont is the global leader in quality work gloves, offering you superior hand protection in the garden and on the work site. Now in Australia, there’s a glove perfect for your task or occupation, to save you from cuts, abrasions and other injuries. Wells Lamont began in 1907, five sewing machines, a handful of cotton cloth, and a passion for high-quality gloves. Since then, we have worked hard to uphold our century-long legacy of quality, reliability, and always putting the customer first. We have doubled-down on the strengths that make up the core of our brand: we do what our competitors cannot do, our customer is always our top priority, and there is no substitute for a quality product. 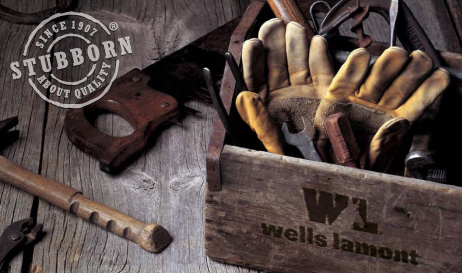 Wells Lamont offers you a range of gloves to suit your needs. From working in the garden to construction on the building site, your hands will be better protected, safe and dry, with a Wells Lamont glove on.